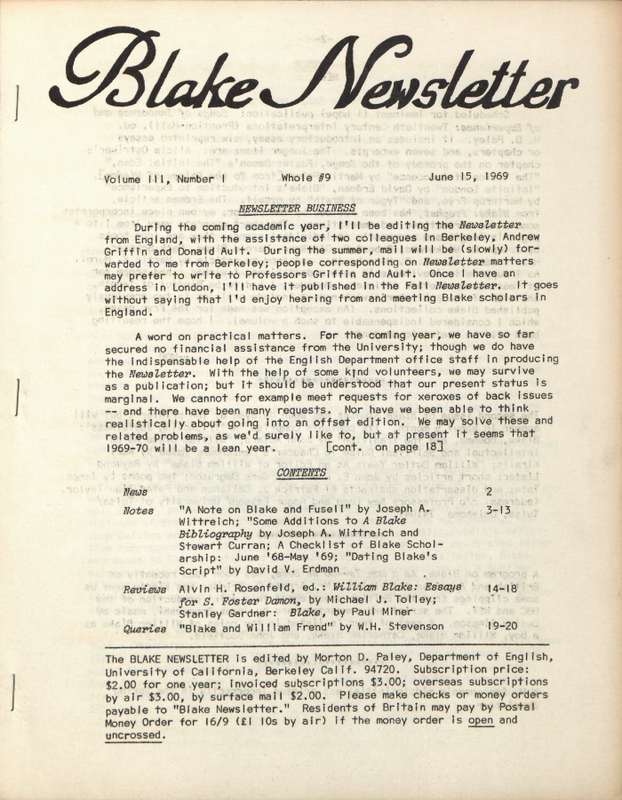 The BLAKE NEWSLETTER is edited by Morton D. Paley, Department of English, University of California, Berkeley Calif. 94720. Subscription price: $2.00 for one year; invoiced subscriptions $3.00; overseas subscriptions by air $3.00, by surface mail $2.00. Please make checks or money orders payable to “Blake Newsletter.” Residents of Britain may pay by Postal Money Order for 16/9 (£1 10s by air) if the money order is open and uncrossed. During the coming academic year, I’ll be editing the Newsletter from England, with the assistance of two colleagues in Berkeley, Andrew Griffin and Donald Ault. During the summer, mail will be (slowly) forwarded to me from Berkeley; people corresponding on Newsletter matters may prefer to write to Professors Griffin and Ault. Once I have an address in London, I’ll have it published in the Fall Newsletter. It goes without saying that I’d enjoy hearing from and meeting Blake scholars in England. On another subject — reviews. When we began the Newsletter, we published no reviews, on the assumption that Blake books were amply and expeditiously reviewed elsewhere. We soon discovered that this was often not the case and that, besides, there existed a need for reviews aimed at a more specialized audience. Our policy is to give reviewers complete freedom, both as to length and as to opinion: there is no editorial policy concerning “rightness” of views, and the editor is of course not responsible for the views of contributors. In addition, our pages are open for disagreement in form of discussion articles. We would like to have a wide variety of reviews and reviewers, and we invite readers who have published on Blake to correspond with us if they are interested in reviewing. This June issue contains once more the annual checklist of Blake scholarship. Its chief virtue, as we have said before, is timeliness rather than completeness. It would, however, be more complete had more of you sent offprints.